The Duomo dominates central Milan and your tour begins with this t architectural marvel. 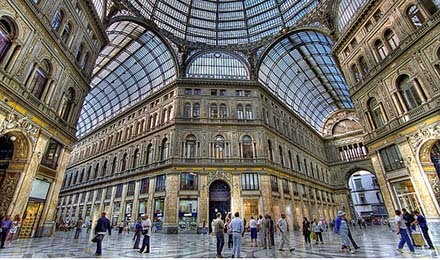 Next to Duomo there is fascinating "Galleria Vittorio Emanuele II", a 19th century glass vaulted shopping arcade, one of the first examples of Art Nouveau Style in the world. In Milan, the Galleria is still called "the living room of the Milaneses", because it was the meeting point of Artists, Poets, and Men of Letters in the 19th century, in its bar and cafès, still existing inside the Galleria. From there it is a short journey to Castello Sforzesco. Originally built by one powerful Milan family, Visconti, then expanded by another, Sforza. You then view the exterior of the world's most renowned opera house, La Scala. You can only imagine what splendor befell patrons of the past who came here to experience works of Verdi and Puccini. La Brera Gallery Picture Gallery is your next stop. We will concentrate on the selection of 20 best paintings, which prove why the gallery is one of the most important in Italy. The climax comes with the viewing of Da Vinci's "Last Supper". Your pre-booked tickets (not on Monday, the museum is closed) assures you quick and comfortable access to this timeless treasure. Your Lecture-Guide explains the cultural and historical significance of this bustling city, now Italy 's center for business and fashion. Is there more on your wish list ? Let us know how much time you have and what your interests are and we will design your ideal personalized tour: educational, fun, efficient and safe.